I was born of Anglo-Irish parentage in the East End of London, the youngest of six children and the only girl. Although I have written from childhood, my first novel being penned in an exercise book, my earliest ambition was to be an actress. I pursued this aim, and managed to get work in a couple of repertory companies and did walk-ons and small parts in a few television shows. I soon realised, however, that I didn’t really have the drive required for acting and thereafter threw my energy into writing. After having a few articles published I was commissioned by SPCK (The Society for the Propagation of Christian Knowledge) to write a non-fiction book about living alone. This was published as SOLO in 1987. I was very grateful for this opportunity. Writing non-fiction is a completely different discipline from novels and I’m glad when I have the chance to do it. However I still wanted to be a novelist, in particular, a crime novelist. I then set out on the well-trodden path of many writers in producing manuscripts, submitting them to agents and publishers and receiving only rejection letters in reply. All this changed in 2012 when I heard that the publisher, Lion Hudson, was introducing an imprint, Lion Fiction, and were looking for new writers, covering a selection of popular genres, murder mysteries being among them. Long story short: My first novel, Game Set and Murder was published in the October of 2013 and has been followed in 2014 by, Dead Gorgeous. You can read all about these two books here. I’m now busy working on a third novel. These novels are all set in a high-profile locations or events and there’s a reason for this. The background for Game, Set and Murder is the tennis tournament at Wimbledon, perhaps the most famous tennis occasion in the world. The original setting for Dead Gorgeous was a fictional hospital and when I presented it to the publisher’s team they hesitated about the locale of the book. They liked the story but felt that, after Wimbledon, an anonymous location wouldn’t carry the series forward with quite enough panache to do it justice. I saw their point and changed everything. So Dead Gorgeous became a novel set in the fashion world, leading up to London Fashion Week. To be honest, I like the buzz of these big occasions. London is such an exciting place with a lot going so I’ve got plenty of scope. 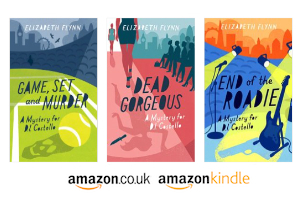 You just wait and see what the third ‘D.I Costello’ mystery is all about.